It's been a busy few days! 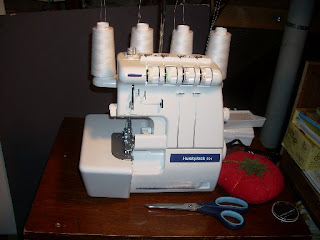 We went into the city on Thursday and I took the plunge and purchased a serger. It's a Huskylock 901, a good and sturdy machine. It really amazes me in all it can do, and it's so nice to have finished seams. 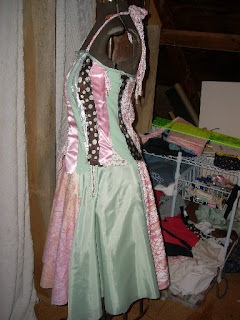 One of the first things I did was finish the seams on several of my costume pieces. Better late than never, right? I found that elusive cable! It's irritating, but it goes missing nearly every time I need to get my pictures from camera to computer. Anyway, I have plenty of pictures of the finished product. 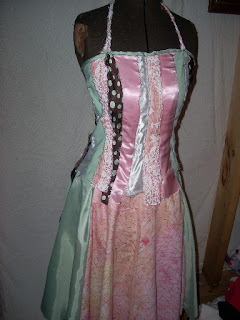 After setting the bodice as you last saw it aside for nearly a month, I pulled it out, finished the top edge, put a zipper in back, attatched the straps, and cleaned it up a bit. Then, using my waist and hip-to-knee measurements, I cut out a circle skirt from an old sheet. 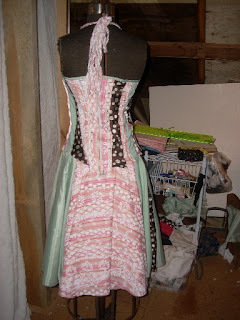 Using it as a rough template, I cut out six pieces of various fabrics that matched the top, all within the measurements of the sheet-skirt. After a few more seams to put the pieces together, I sewed the new skirt and the mock-up together (lining). 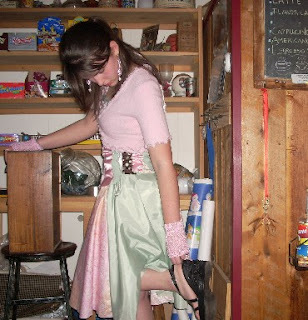 Staying in the recycled and scrappy theme of this dress, I ripped the fly zipper out of an old pair of shorts and set it into the side of the skirt. 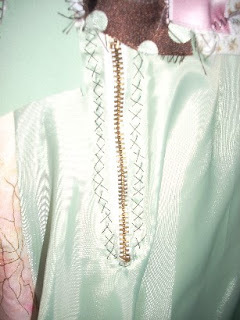 When I can, I like to put zippers in by hand because I can control the fabric so much better. So I stitched some pretty X's along side to make it look funky. As it often happens, my hand stitching turned out messy and un-even. Still, it looks pretty cool. ...I should definitely have less distractions in the picture next time. See the little cropped sweater? That was a fun and quick thing I did using a tight zig-zag stitch and scissors. It used to be a v-necked sweater made of acrylic and something stretchy. I made it into something much better. Once I got my serger I hemmed the skirt in black contrasting thread. Now, the only thing left to do is sew hooks and eyes to the inside of the bodice and the outside of the skirt so they stay together when I need them to! Lastly, here's a picture of my new baby.